Review: "Sun Caged: The Lotus Effect" - Sea of Tranquility - The Web Destination for Progressive Music! The Lotus Effect is the third Sun Caged album after their self-titled masterpiece (with a very different lineup) which mixed progressive metal with Meshuggah-like heavy riffing and fusion-laden passages and Artemisia, which saw the band veer into more melodic territory thanks to the vocal style of Paul Adrian Villareal. The new album strikes the perfect balance between the first two albums. The songs are no longer inspired by fusion as heavily as they were on the first album. They are not as heavy in terms of Marcel Coenen's riffing either. They lend themselves to melodic metal territory without sacrificing their progressive tendencies. Actually if you, too, are tired of all those melodic metal bands with the occasional synth solo and a high-pitched singer labeling themselves as prog, then The Lotus Effect is what you are looking for. Complete with masterful instrumentation, plenty of intricate guitar and keyboard solos, melodic vocal harmonies, and dexterous rhythmic flow, the songs lend themselves to all sorts of different category. There are the traditional prog pieces that contain sick unison solos on tracks like "Tip Toe the Fault-Line," the more restrained pieces on the ballady "Reductio ad Absurdum," and the experimental pieces with tribal drumming and percussion on "Lotus," all of which widen the scope this disc. However, despite the varied nature of the album, it never strays from the core Sun Caged sound thanks to Marcel Coenen's signature songwriting vision and guitar playing. On this album, there is more tonal definition in his tone selections, and he displays admirable restraint when it comes to head-spinning solo passages. This results in the song "Pareidolized (The Ocean in the Shell)" being a standout. The trade-off between guitars and synths on this one is sublime, and perhaps one of Coenen's best. Rene Kroon's keyboard work is stunning. Not since the first Circus Maximus album or Andromeda's Chimera has a band achieved such musical perfection. Kroon's sense of melody development depends on a unique elevation technique in which a powerful keyboard theme is formed as a background element to the song. Then, throughout the course of the song, the melody is subtly developed and it climbs beneath Villareal's vocal harmonies. The aforementioned "Tip Toe the Fault-Line" is characterized by Kroon's ascending synth modulation and works to great effect -- as Villareal sings lower, the keys climb higher, and everything concludes with a majestic interplay between the main instruments. New bassist Daniel Kohn from Germany only plays on the song "Parasol" and the mind-twisting fretless solo on "Pareidolized" while everything else was done by former bassist Roel Vink (who had replaced the great Rob van der Loo). Vink's contribution to the album is tremendous. His slap bass on "Shades of Hades" (with great rapid-fire vocals a la Pain of Salvation at the end) is the heart of the song as is his spidery low end present throughout the whole disc. Vink also opens up a portal to Coenen's sweeping fretwork, especially on the first song "Seam Ripper (& the Blanket Statement)." The vocals on this one had me think of Ray Alder in terms of melody construction. Production-wise, I am reminded of two albums in particular: the first Redemption disc which also has a somewhat similar tracklisting with seven 'normal' songs and a 20-plus-minute epic. The other album I would compare it to due to its mastering is the third Spheric Universe Experience disc, Unreal. For my tastes, the songs are mastered a bit too loud and heavily compressed. The first ten or fifteen times I played this disc, I had issues with it, but now, I've grown used to it as I got into the compositions. Still, the production job aside, this album is so far the only progressive metal disc of 2011 that I enjoy from start to finish (along with Cynthesis' DeEvolution). Hopefully, I'll be able to add a few more discs to this list when the new Redemption, Dream Theater, Arch/Matheos, and Vangough discs see the light of day in the coming months. I've had the chance to follow this band since their inception. I still rememeber getting my copy of their Scar Winter demo from original drummer Dennis Leeflang as well their Dominion EP. This band has paid its dues, so if you're a prog fan, please support them. It always seems like the wait for a new Sun Caged CD is close to an eternity, and while three albums in 8 years might seem rather slim, compared to some other acts in the progressive metal scene it's pretty prolific. 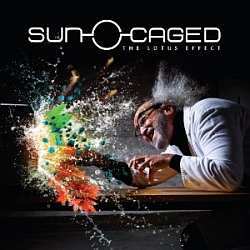 Sun Caged of course are the Dutch band led by former Lemur Voice guitarist Marcel Coenen, and The Lotus Effect is their third and latest CD on Lion Music. If you loved their first two albums, then chances are you'll be more than happy with this one, as it combines the progressive nature and crushing metal attack of both of those, wrapped around a melodic sheen which makes for a most impressive overall delivery. Paul Adrian Villarreal's vocals are just astounding, as he soars over Marcel's crushing riffage and the charming keyboards courtesy of Rene Kroon. As we've come to expect from this band, they balance the more song based material with some sizzling lead work, so be on the lookout for some scary exchanges from Coenen & Kroon, especially on the blistering "Tip-Toe the Fault-Line". I could go on and on with a track by track analysis, but I think the safest and best thing I can tell you here is that if you are a progressive metal fan, you need The Lotus Effect in your collection. It's that damn good!